an introduction and overview . . .
Italy produces more wine than any other country. It has a very strict, but problematic, system of nomenclature, with some 220 different designated zones of production. There are over 300 grape varieties used in making Italian wine. This can make Italian wines very confusing. And for an overview of "the new noble whites" of Italy, see white wine of Campania. But do not be discouraged. True, the Italians seem to do their best to create a wine world that is both confusing and daunting. But stick with it. Put forth some effort: learn, investigate, try. There are wonderful wines here to be enjoyed that will be more than well worth your efforts. Wine levels are designated, by government edicts, as DOCG, DOC, IGT and da tavola, in that order of excellence, or intended excellence (see following). The most famous, and most likely to be encountered, is DOC, denominazione di origine controllata. The designations define geographical zones of production, edict strictures and rules relating to permitted grape varieties to be used, yields, alcohol levels, aging requirements and production methods. DOCG, denominazione di origine controllata e garantita, is a more tightly defined and more structured DOC. IGT, indicazioni geographice tipiche, the newest designation, supposedly designates some wines as regional specialties, like French vin de pays. There are some 150 of these. The remaining wines, for the table and for quaffing, are vino da tavola, the lowest category. But these also could be the very best wines one can buy. No wonder confusion exists. During the past two decades, some vintners, starting in the Chianti region, found that by adhering to these strict DOC rules, they were prohibited from making the best wine their grapes and their skills could produce. So they ditched the rules and made the best wine they could. These first special wines are the Super Tuscans. But because they did not follow the rules, these wines, acclaimed as the among the best wines in the world, are required, paradoxically, to be labeled as vino da tavola, table wines. Go figure. Italian wines are best first understood by the region in which they are produced. To follow this route, go to: wine regions. Beyond our simple, introductory approach here, there is a vast amount of extremely good, detailed and thoughtful information available. To check this out, click on wine links, a list of and links to web sites we found helpful. Plus there are several very thorough, outstanding books available on Italian wine. Find these by going to the library. Given the large volume of wine produced in Italy, it is not surprising that for many years the goal and mind set of growers and vintners was on volume. A lot of very ordinary (at best) table wines were produced and bottled or mixed with other grapes. And true, many of these ordinary wines were produced in strict accordance with the DOC laws. In the past twenty or thirty years there has been a dramatic increase in the number of superb Italian wines, produced by vintners who reduced yields, concentrated on quality, and became experts in their fields, both literally and figuratively. We will highlight some of these excellent wines. Reds: Italy is capable of producing, and does produce, some of the finest, if not the finest, red wines in the world. These wines are also unique. Cabernet Sauvignon, Merlot, Pinot Noir and Syrah, for example, are produced in excellent fashion in many regions of the world. Nebbiola and Sangiovese, the two key red wine high-quality grapes, thrive, so far, in Italy alone. Whites: Italian white wines are another story. Opinions vary, but ours is that if you wish you can buy clean, fresh, flavorful whites, mostly from Pinot Grigio and Chardonnay grapes, made in the northeast of Italy, especially Friuli. 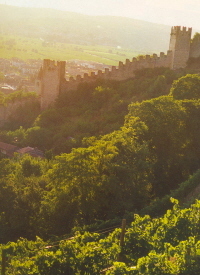 Other whites, while lovely to drink while eating in their native regions, do not really travel well, if at all (our opinion)But there is forward movement: some white wine vintners are also working to improve their quality and output, starting, appropriately, in the Soave region in the northeast. >>For a recent alternate opinion on Italian white wines, we quote from a column by Janis Robinson, the noted UK wine author, in Sept. 2007: "The single most exciting recent phenomenon in Italian wine for me has been the revolution in white winemaking. It is now just so easy to find fantastically fruity, nervy, exciting whites such as Verdicchio, Soave, and a host of varietals and blends from all over Friuli and Alto Adige." So take it from there. >>We also take it back! We discovered a wonderful white from the southern regions: Greco di Tuffo, from Arellina, east of Naples. This is a white from grapes brought from Thessaly, Greece about 5 B.C. or before. Grown for centuries around Mt. Vesuvius the talented winemakers from Arellina have taken this grape and created a gem: some of their output rates over 90 points in Wine Spectator. We think it is probably the best Italian white made from native grapes. Superstars: The superb reds come from two areas: Piedmont and Tuscany. Piedmont has its Barolo and Barberesco. A small, specific area of Tuscany is home to Brunello di Montalcino. Elsewhere in Tuscany, in both the Chianti and the Bolgheri districts, one can find the special vintners producing Super Tuscans, from Sangiovese or from combinations including Cabernet Sauvignon and merlot. A special case also can be made for Amarone, the deep, chewy high-alcohol wine made from Valpolicella grapes. Great next level: Just below this top tier are other wonderful reds, varying between deep, long-lived wines benefiting from aging, to superb wines ready to drink now. In Piedmont, there are Gattinaras and Dolcettas, for example. In Tuscany, there are now superb Chiantis, and Vino Nobile from Montepulciano. One of our favorites is Rosso di Montalcino, a lighter Brunello. Some Valpolicellas from the northeast are now excellent; Montepulciano d'Abruzzo can be delightful. Quality wines are being made from the negroamaro grape in Puglia, and Sicily is producing some wonderful wines. Marsala and other desert wines, and the sparklers, like Asti Spumante and Pro Secco are covered in the regions. Aiding and abetting: With the rapid growth in quality and climate of Italian wine products, and because there are so many growers, bottlers and grape varieties, it is highly recommended to find a good source -- a wine shop or distributor -- that you can trust and learn from.